Parkinson’s is a challenging disease both for those who suffer from it, and for their family members. When diagnosed early, there are many things you can do to minimize symptoms, including exercises, some of which we’ll list here. Pay attention to the way your foot lifts and lands as you step. Walking is also an all-around healthy way to get exercise, and should always be part of your daily routine. Seated Hamstring Stretch: Sitting at the edge of a chair, extend one leg straight, keeping the heel on the floor, while your other legs stays bent. Placing your hands on your bent knee for support, lean forward until you feel the stretch in your hamstring. Hold for 5-10 deep breaths. Forward Bend: There are a couple of ways to stretch your hamstrings while standing. If you are more mobile, you can do a simple forward for, bending over your legs and placing your hands wherever is comfortable (ie. shins, ankles, floor, grab opposite elbows). Depending on your flexibility you can forward bend over straight or slightly bent knees. Hold for 5-10 breaths, and be sure to come up slowly. Standing Hamstring Stretch: This is an adaption of the seated hamstring stretch, and is a great way to stretch hamstrings without any strain to your back. From standing, place one foot on a stool or chair (make sure it won’t slip!) and straighten your knee. Keep your chest and back straight as you slowly bend over your knee, and hold for 30-60 seconds. Repeat on the other leg. Combat a rounded spine with a simple chest opening stretch. While seated, bend elbows and clasp your hands behind your head. Keeping your spine straight, and without any strain on the neck, push your head back into your hands and move your elbows as close together as you can. Perform about ten repetitions, trying to stretch as open as you can without strain. While performing any exercise, pay close attention to your breath. 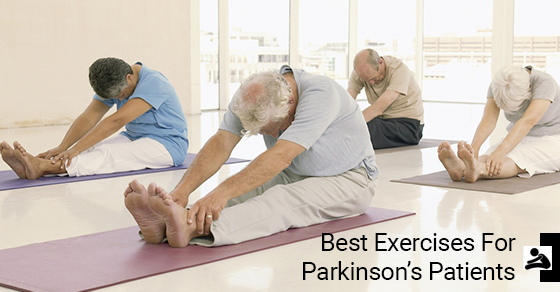 Even just sitting comfortably and breathing deeply any day is beneficial for Parkinson’s patients. Pay attention to the way air fills your diaphragm and stretches your body. With any exercise, it’s important to listen to your body and avoid pushing yourself too far. Any concerns should be taken up with your doctor. C-Care is pleased to provide high-quality, fully customized care for those with Parkinson’s. Contact us today for more information.